Radical Lines Aerial Adventure Park is a family owned and operated business. We have lived on the property enjoying the peace of Norfolk's Old Growth Carolinian forest for over 35 years. Aerial challenges on 64 different elements/games. 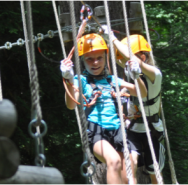 These include suspension bridges, cargo nets, tarzan swings, lumberjack logs and much more!